​Welcome to School Nurse Link. ​On this simple, easy-to-navigate ​site you will find information to support care of your students, especially those with chronic conditions. 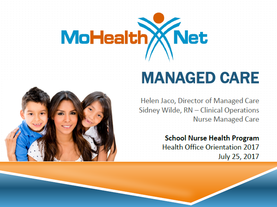 The School Nurse Link program connects all schools (public, charter and private) with resources offered by Medicaid health plans in Missouri. Together, these plans cover about 500,000 children across the state, located in every community. 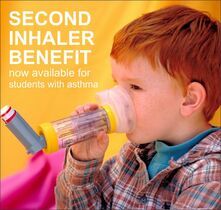 SECOND INHALER BENEFIT -- FOR STUDENTS WITH ASTHMA. Effective December 1, 2017. Students with asthma are able to obtain a second inhaler from the Pharmacy Program by MO HealthNet. An extra inhaler could be kept at school, at a second house where a student lives during the week, etc. MO HealthNet is distributing letters to parents of children with asthma about this special benefit and notifying physicians and pharmacists as well. If you have a student who could benefit from access to a second inhaler, contact the Pharmacy Program Service Support Line for School Nurses at (800) 392-8030, option #3. Parents/guardians may also call this number and request assistance directly. View slides from the 2017 Health Office Orientation presentation by MO HealthNet to school nurses. The content focuses on managed care and includes critical information about enrollment process (p. 13), advantages to managed care to members (p. 9), changing health plans (p. 16), additional benefits offered by the managed care companies (p. 26-28), and family advocacy organizations (p. 31). Special thanks to Helen Jaco, Director of Managed Care, and Sidney Wilde RN, Clinical Operations Nurse Managed Care for sharing these materials. Try it out. Ask for the resources and support your children and families need. Managed Medicaid health plans hold immense untapped potential to assist school nurses. School nurses have the ability to provide care to our children in a unique way. They bridge the gap that often exists in day to day care and support the various requirements that long-term positive health outcomes require. We are honored to stand and partner with school nurses!